Inserted between a century-old brick warehouse and a row of Victorian terrace houses on what was once a small carpark, the Beehive refuses an immediate reading at first sight. 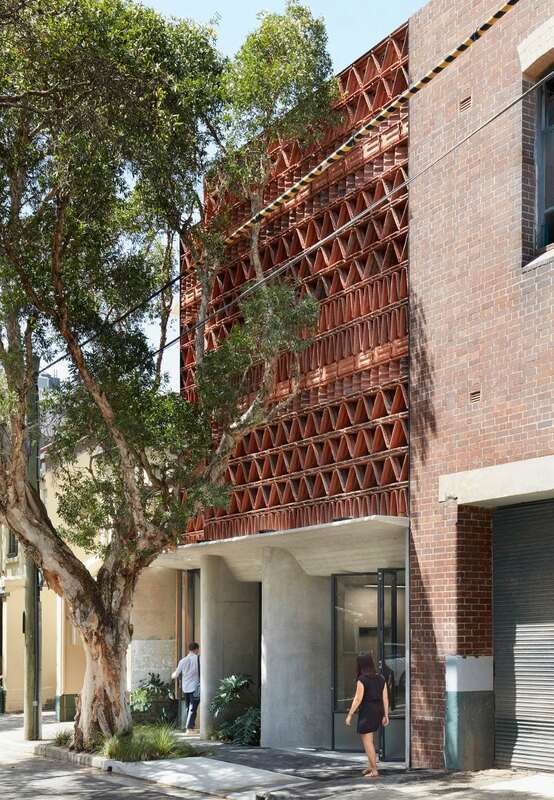 Upon approach, the use of stacked terracotta tiles in the façade is revealed, reconfigured into a rhythmic Brise-soleil. 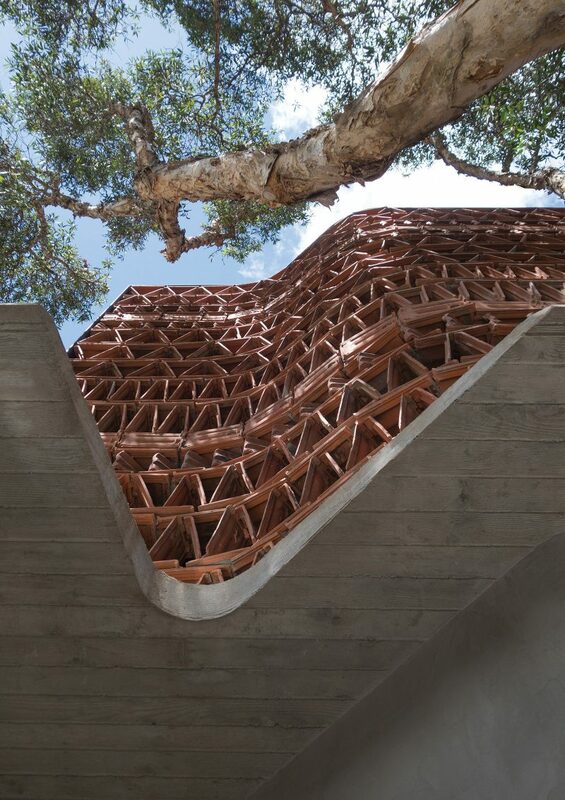 The project explores the perceived limitations of terracotta tiles and celebrates the layers of filigree and geometric complexity that can be found in the overlooked terracotta tile. 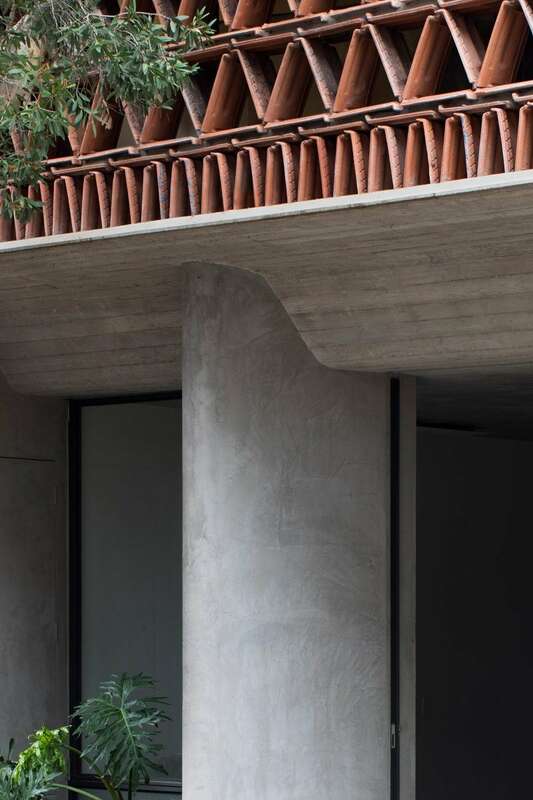 Utilising recycled materials from the start rather than an afterthought, the terracotta tile was chosen as it is a ubiquitous material without an established reuse market. The project is a celebration of the immediacy and the unpredictability of creation using what is discarded or found rather than new materials, by creating a new bricolage that demonstrates how waste products can be reimagined and reused with minimal energy. The project started with the study of material waste streams for an appropriate object for a brise-soleil to filter the harsh western sun that the main façade faces. 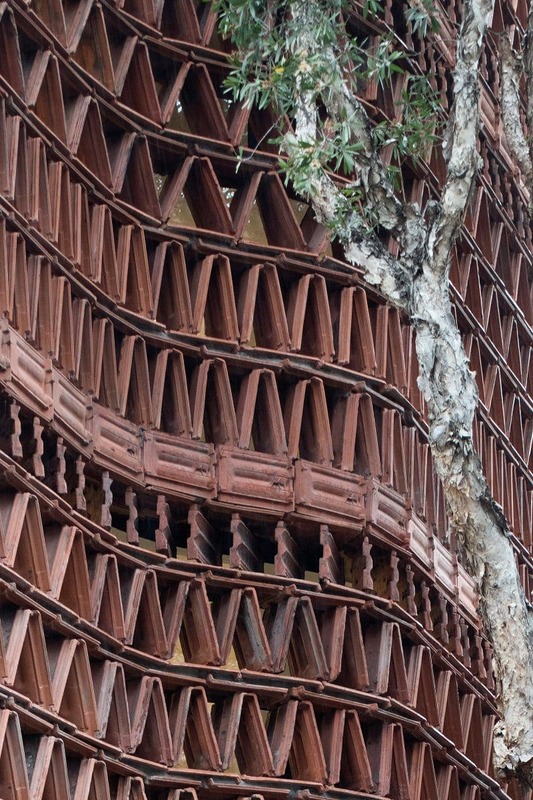 The humble terracotta tile was chosen as it is an overlooked material without adequate reuse market. While out of manufacture tiles are collected, newer tiles have no market value and find their way to landfill. Material reuse has near zero embodied energy and hence is a very important step at reducing construction impact. This project attempts to add value to reused materials and change the public often negative perception of material reuse. Putting aside the tiles commonality, the terracotta tile appealed because of its raw elemental materiality, with no tile exactly alike, cast in clay and fired still by hand. The process of design was also unique for this building. In response to an object which was geometrically complex, the façade design was largely conceived through multiple full-scale tests and prototypes. This opened up a rudimentary form of designing through making. The intuitive tactility of the process allowed rapid prototyping, experimenting with multiple tile course types. This design process allowed us to make of the use of the module to further tackle challenging elements of the design and resolve them physically. 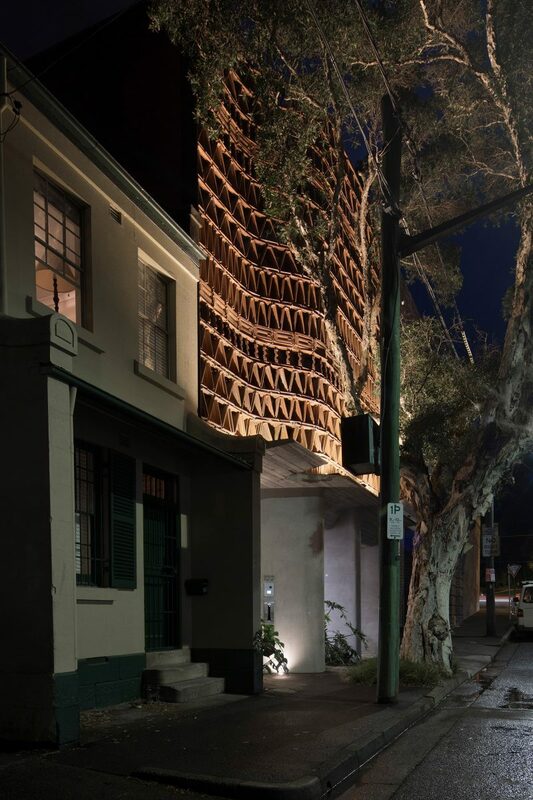 Such as the curved tile façade, which was crucial to give the façade proportion within its built context by linking its misaligned neighbouring buildings and stepping back from the paperbark tree in front of the site. 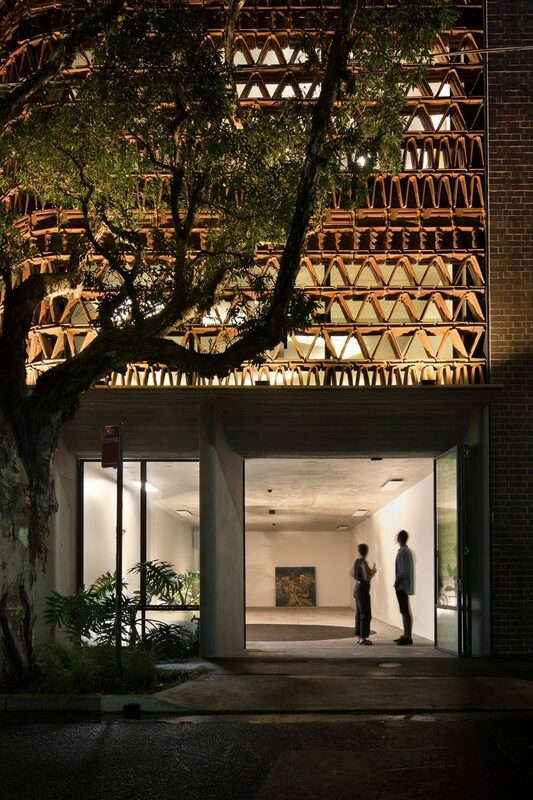 Internally, the building is a light-filtered architecture studio designed as an environment to stimulate creativity and teamwork: a ‘Beehive’ of architects. Challenging the generic and often alienating nature of open plan office buildings, the design sought to provide an active but intimate environment with multiple working positions offered by custom-built joinery, which was largely repurposed from the former studio, another component of the upcycling drive on this project. 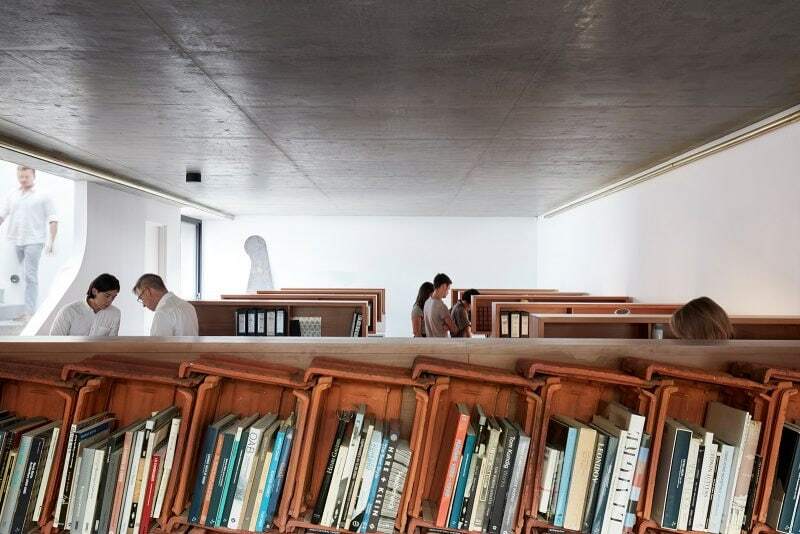 The main space does not have any walls, rather is defined by two linear rows of semi-enclosed booths with each architect provided with two desks, linked by a long linear standing bench which facilitates collaborative work. On the top floor, a communal garden terrace offers a point of release to work in the sunshine, hold community events or relax after a long day. 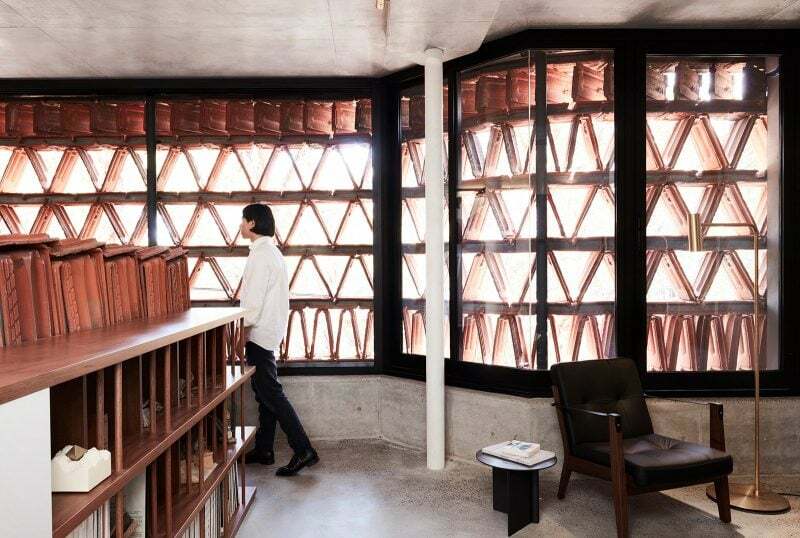 Below, the conference table is semi-enclosed by terracotta tile bookshelf, another variation of a stacked terracotta module. 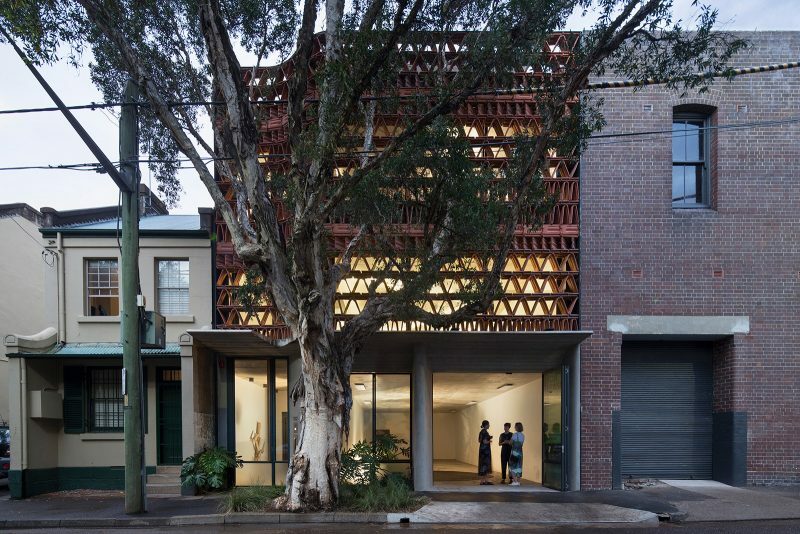 This was a conscious attempt to re-contextualise the value of reusing materials, advocating for more sustainable solutions and showing clients and the wider public that it is possible to reuse the waste products of the construction process, with all their intrinsic beauty. Smooth monolithic piers support an exposed off form concrete awning, created using old fence boards as formwork. 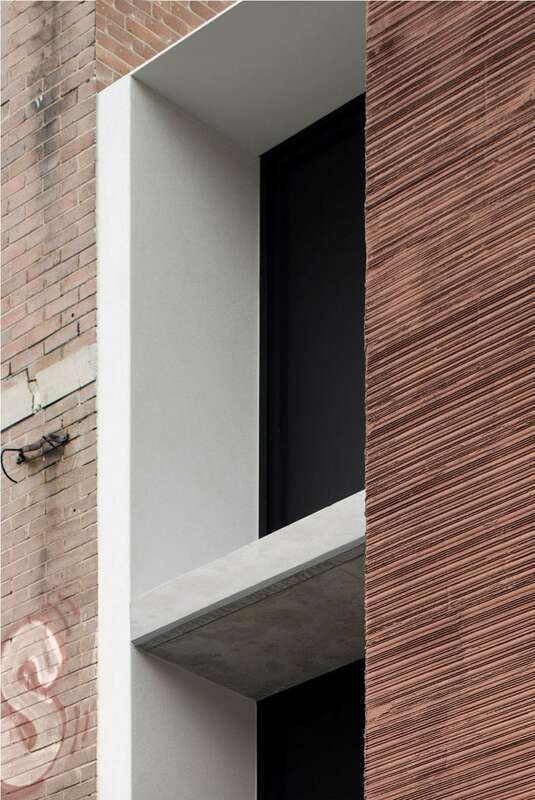 Contextually the terracotta relates well to the raw brick materiality of the neighbouring masonry building. 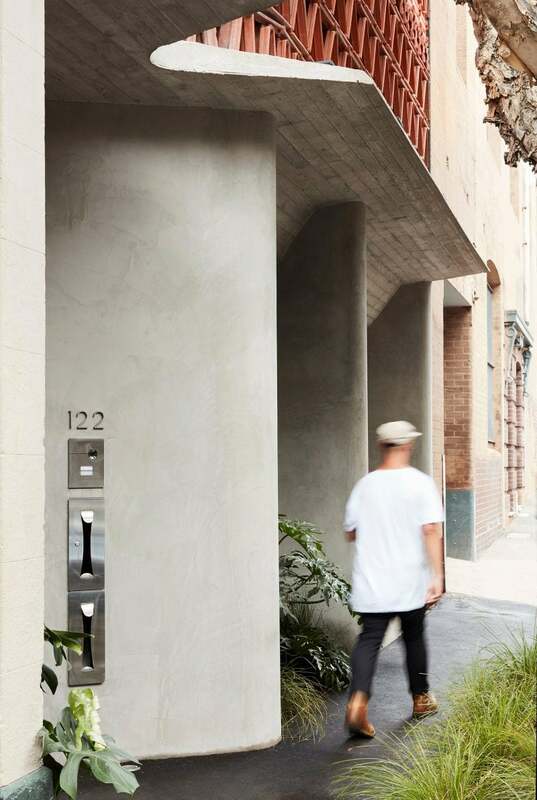 The choice of steel window frames and wire cast glass was the obvious one to suit the industrial history and coarse nature of the Surry Hills. The Missile Man by sculptor Adam Rish in the lobby directs one to the lift or the stair. The construction of the brise-soleil was expertly resolved with multiple 1:1 prototypes working in close collaboration with local craftsman, Callum Coombe. 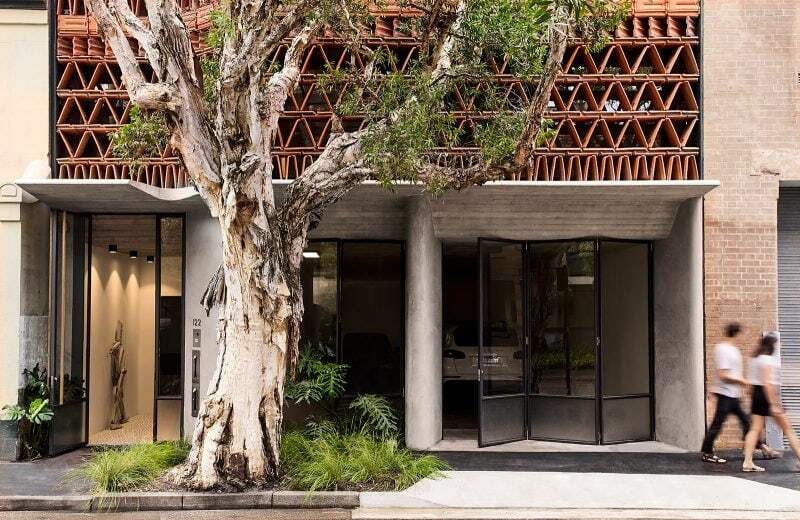 The smooth Rockcote acrylic modified cement render provides a soft contrast to the rough texture of the concrete formwork and the brise-soleil, whose terracotta roof tiles are perfect in their imperfections. The primary west-facing terracotta brise-soleil provides shading, and cross-ventilation at the challenging orientation. 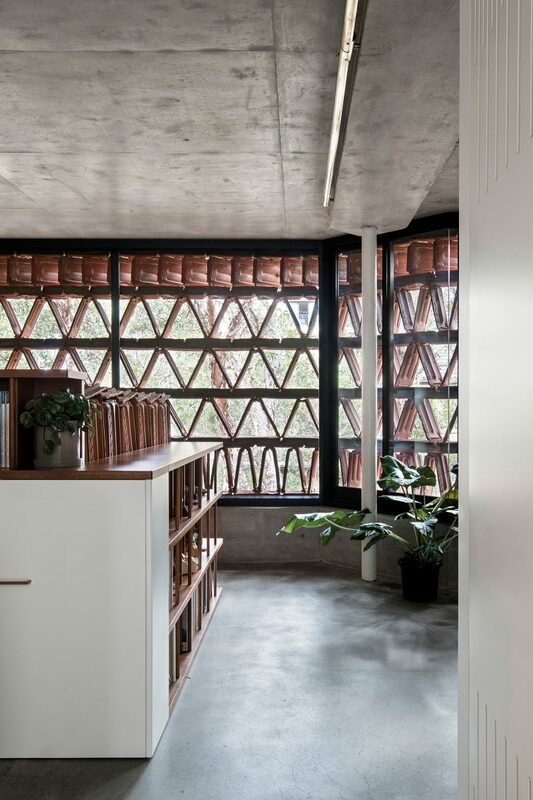 The porosity of the terracotta helps to cool the breeze that filters through the tiles. The majority of the tiles originate from a home that was reroofed in slate; the Marseilles roof tiles were destined for the tip. 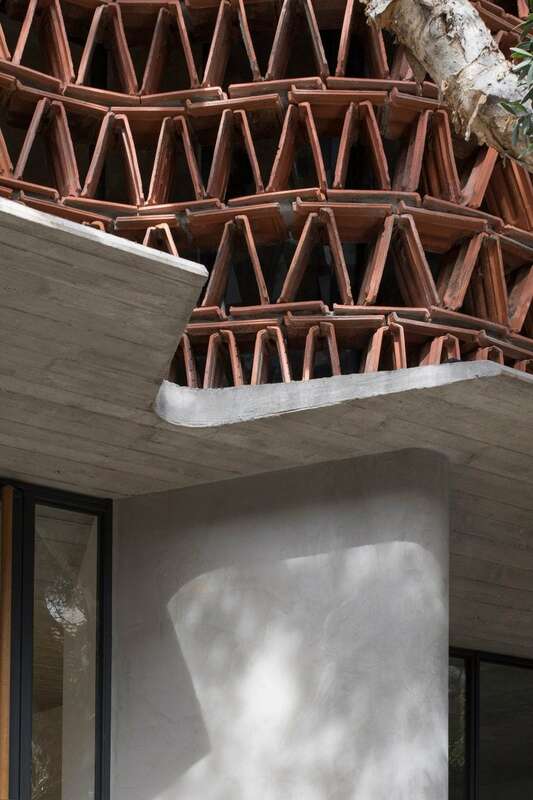 Looking out through the recycled terracotta roof tile brise-soleil. 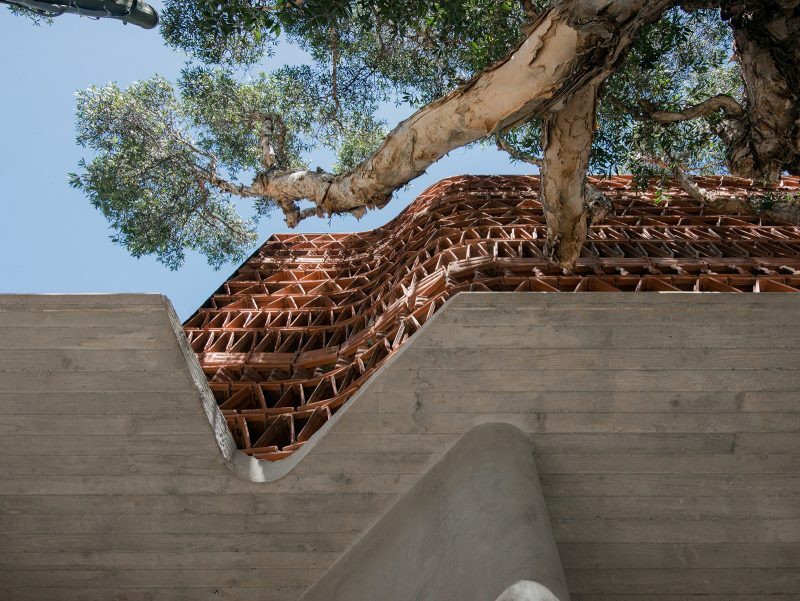 A paperbark tree provides further screening and softening of the hard concrete floor and ceiling. The concrete awning curves up toward the street, opening the ground floor to the light and increasing the proportions of the ground floor. By night, the building reveals a different character, more translucent and less abstract. The building curves back, protecting and retaining the existing street tree and aligning the two neighbouring buildings. The tree is a paperbark - one of a number of different species of Melaleuca plants - which provides a noticeable cooling effect during the hot Sydney summer. When one sits on the other side of the brise-soleil one can almost touch its branches. It should be mandatory for all workplaces to have a roof deck. 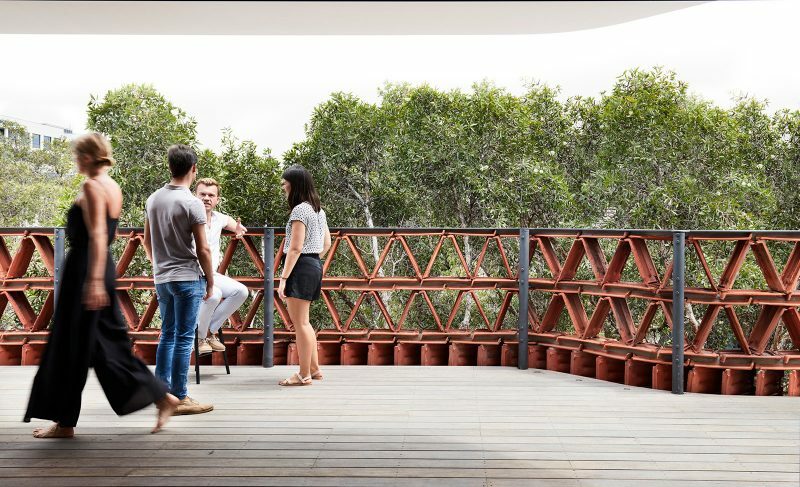 Hidden behind the terracotta screen, this treetop terrace offers a point of release to facilitate a healthy indoor outdoor connection. The decking is clear coat blackbutt timber whilst a thin steel awning protects the west facing glazing. The theme of upcycling might not be obvious in this window, however, it was repurposed from another project under construction, where the Client opted for a more conventionally shaped window solution. To some, this window may be reminiscent of the work of French architect, Auguste Perret, who philosophised that windows should be vertically proportioned in relation to human proportions; to others, it may provoke recollections of the strange Japanese TV game show where one must jump through mobile Styrofoam cutouts formed into odd human shapes. 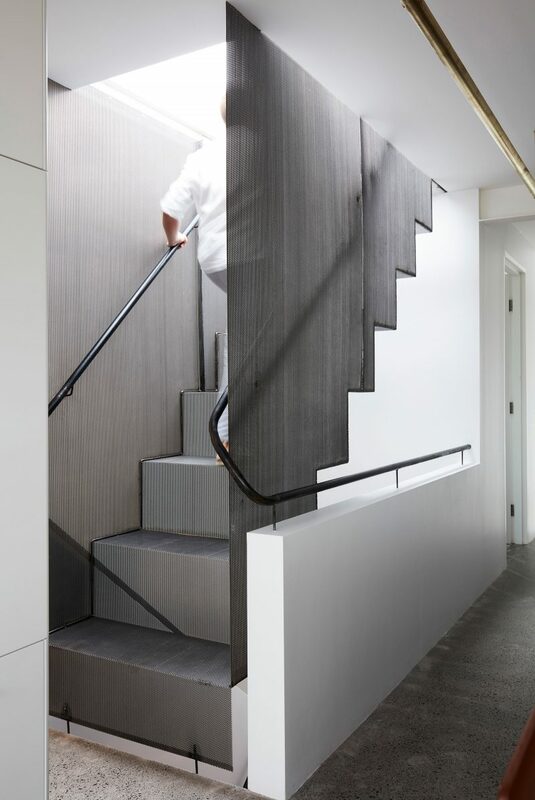 The roof access stair, constructed with perforated steel, rises to allow light to filter down into the stairwell from the skylight which can also be opened to produce a chimney effect to naturally disperse the hot air from the building. The steel is finished with a clear sealer, exposing the black mill finish and the welds. 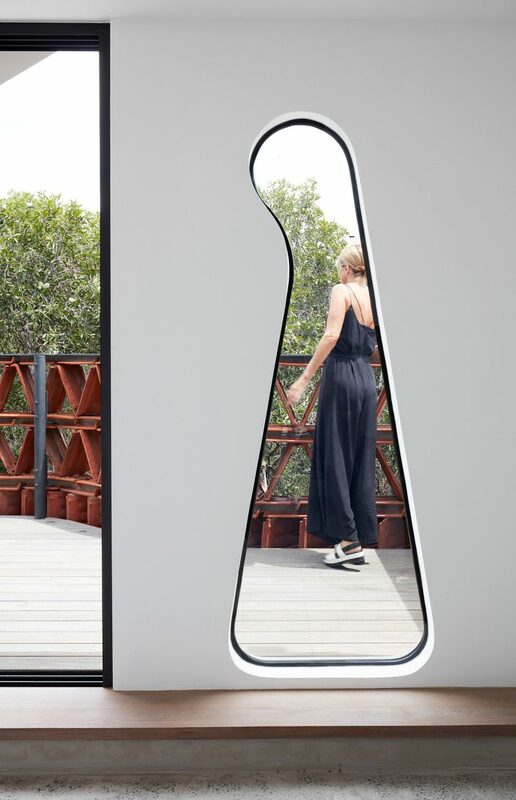 An offcut from the curved window on the upper level becomes a sculpture. A idle figure in ever changing light. 30 years of catalogues finds their home under a standing work bench that links the desks together. A custom fixing for the smoke alarm was required to surface fix it to the concrete soffit. 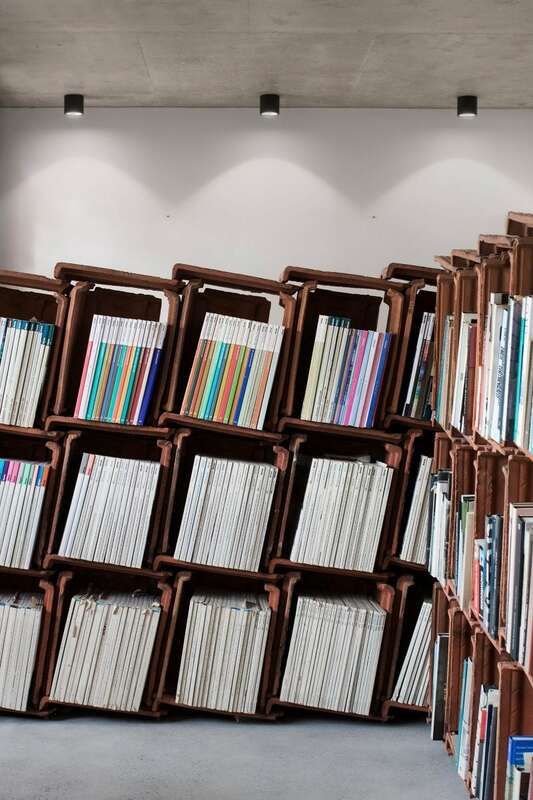 36 years of Domus magazine and counting, ordered chronologically for easy reference. In 90 years, the size has always remained the same. For both Luigi and Raffaello, Domus is an important permanence in their family history. During the 1930s, Luigi's Aunt, Emila (Bebe) was a prominent journalist in Milano and a friend and colleague of Gio Ponti, the founder and collaborator Domus. 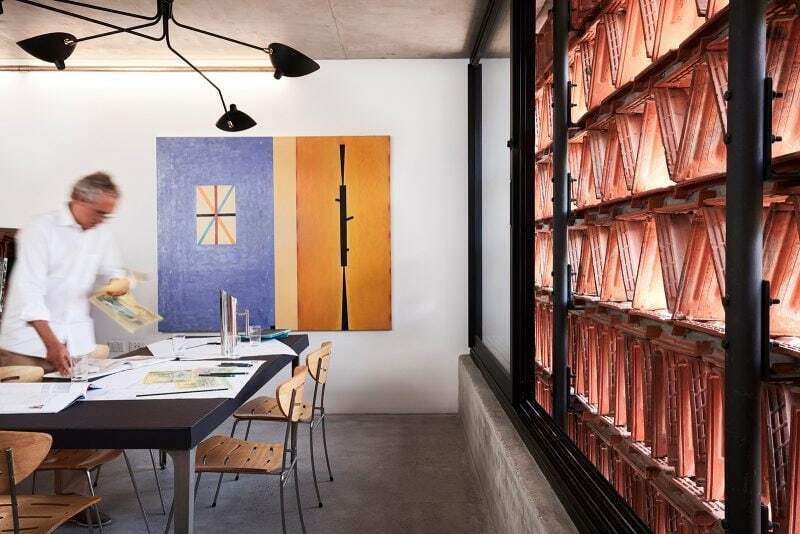 As with the brise-soleil, old terracotta roof tiles have been repurposed to form the 'pigeon hole' bookshelf, which offers a semi-enclosed partition between the meeting room and the workspace. Working booths relocated from Luigi Rosselli Architects' previous studio offer privacy and focus for each architect, yet foster collaboration. Luigi prepares for a schematic presentation with the help of a six armed Serge Mouille pendant hovering above. The chairs were designed and assembled by Luigi in 1992 for a series of restaurants the firm worked on in the 1990s. If you dined at either Stefano Manfredi's or Peter Doyle's restaurants during the 1990s, you may well have sat on one of these custom stainless steel and bent plywood chairs. In the background is a painting by Robert Jacks entitled 'Flag, tower'. 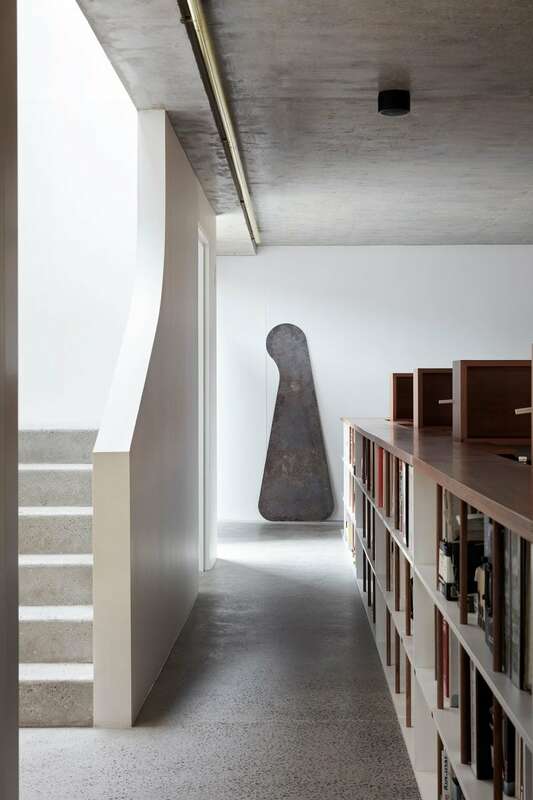 The lower floor of the office has an earthy and moody feel. Dappled light filters though the terracotta screen. The lobby is furnished with a QS Table Small by Atelier De Troupe, a Capo Armchair by Neri & Hu for De La Espada and a Heron Floor Lamp by Michael Verheyden for CTO Lighting, all sourced from Spence and Lyda . On the upper floor, the studio is lit by daylight 90% of the time. On particularly cloudy days, the suspended lights are powered by solar panels on the roof. The brass angle on the edges of the treads is necessary to protect the edges of the mosaic and to clearly mark the edge of each step. 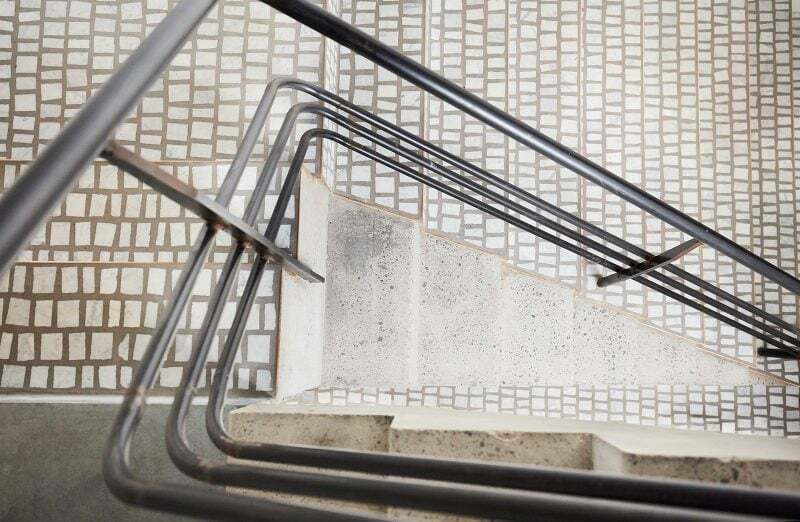 The balustrade railings are constructed in mill finished steel, coated with a clear matt sealer. 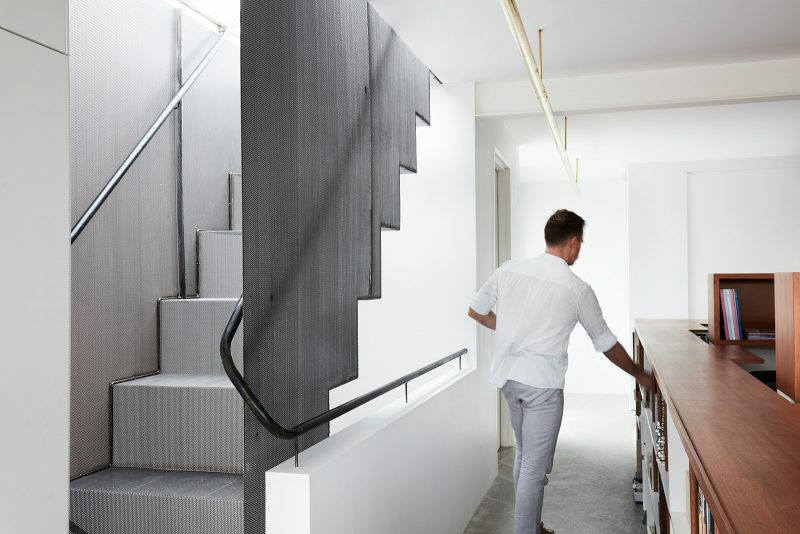 Fire stairs do not only need to be utilitarian spaces. 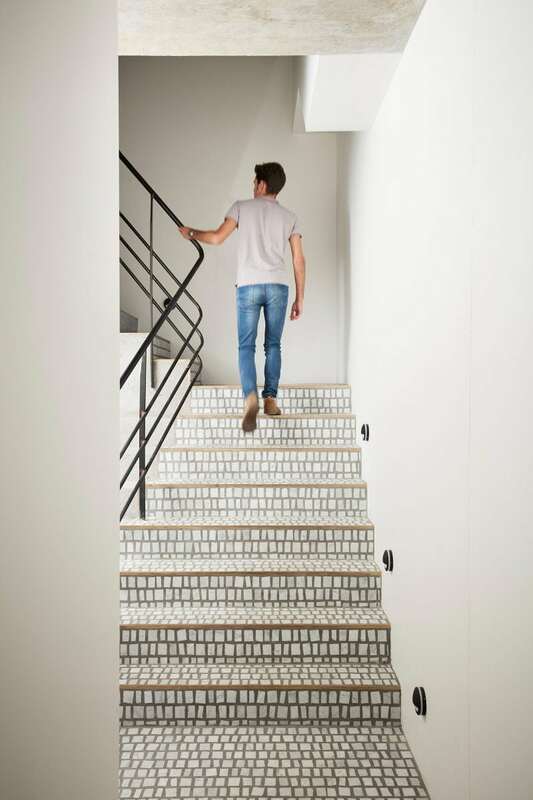 The stair leading to the studio features the same Carrara marble mosaic tiles as the lobby. With just four floors, the stair is designed to encourage people to walk the short distance to the upper levels rather than taking the lift. Enclosed and sealed fire stairs may be fire safe but they force people to opt for the lift and therefore they are a health risk. The Monstera Deliciosa, otherwise known as the Swiss cheese plant casts beautiful shadows in the late afternoon over the Carlo Scarpa inspired mosaic floor. 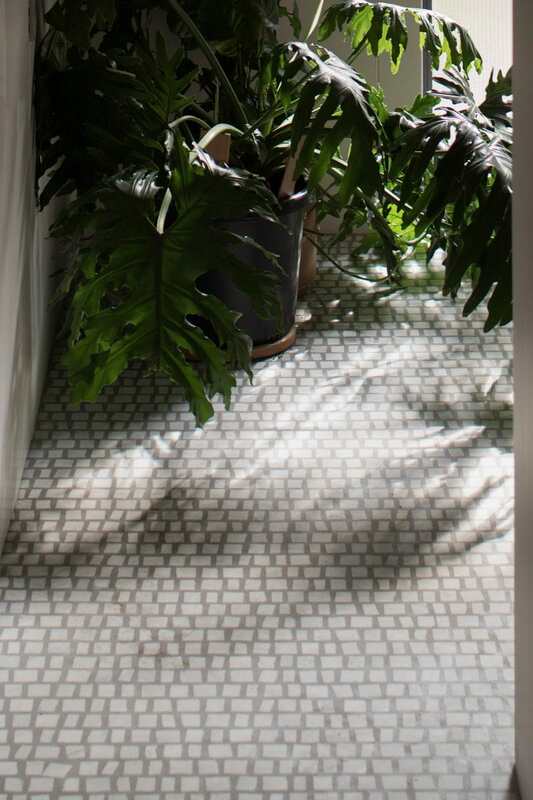 The idea for the floor tiles was described to Tim Stokes of Bisanna tiles and just a few weeks later he came back with a sample of white marble tiles, snapped instead of cut and mounted on a mosaic tile mesh, executed by his brilliant factory in China. 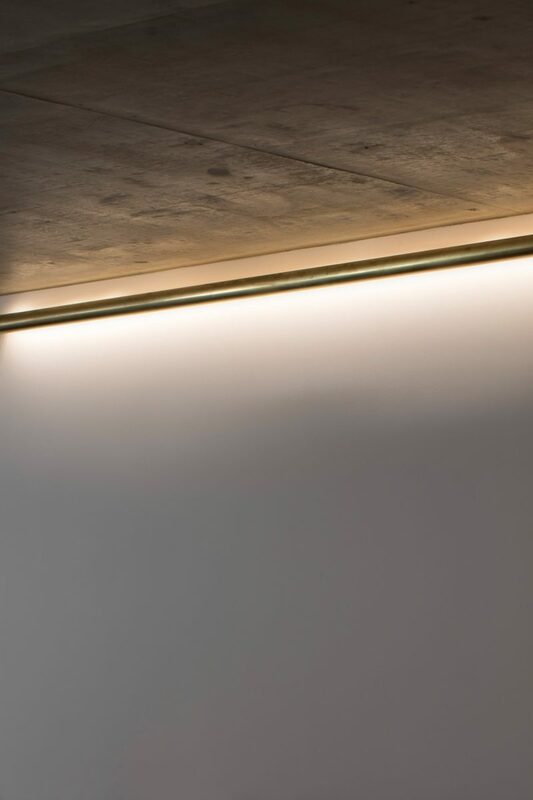 Custom designed brass LED lighting made by brass artist, Oliver Tanner.